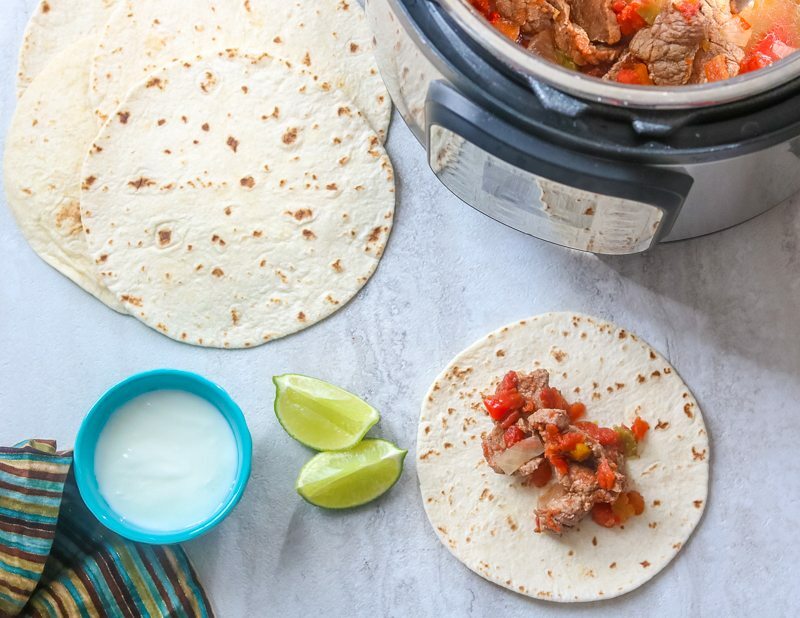 Instant Pot Steak Fajitas: Tender steak fajitas are only minutes away with the help of your pressure cooker! You guys I LOVE Mexican food. Not only does my whole family LOVE Mexican recipes, but I can easily make Mexican recipes, like Tacos, Pork Carnitas and Mexican Grilled Corn at home. And you guys LOVE Mexican Food as well. In fact, many of you have asked for me to adapt my Slow Cooker Steak Fajitas for the Instant Pot. 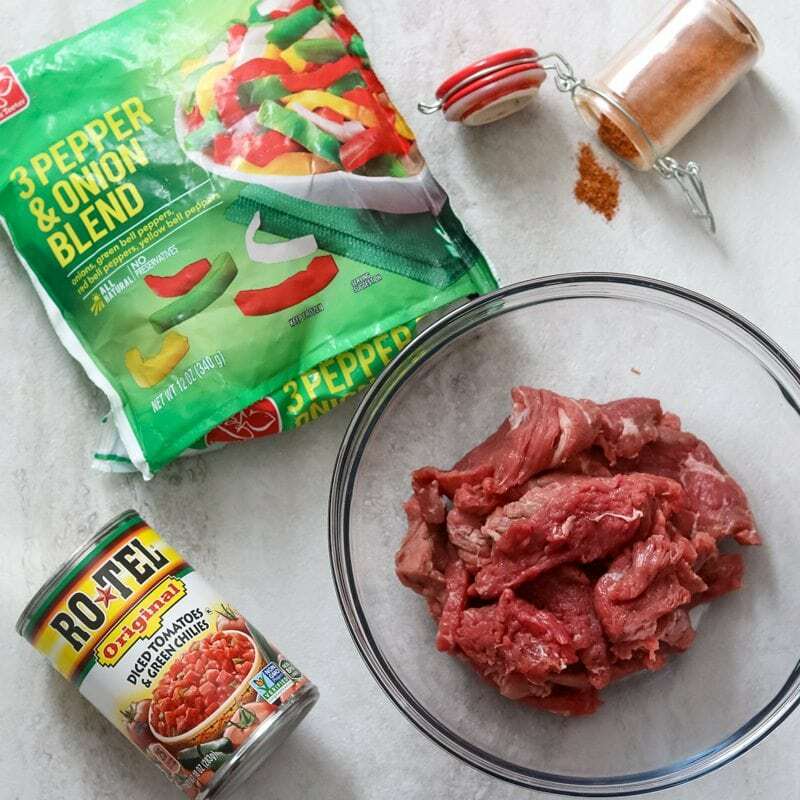 Just like my slow cooker steak fajitas, all you need is a can of diced tomatoes, a bag of frozen pepper and onion strips, taco seasoning, and a flank or sirloin steak. And then it is a simple to dump into the instant pot and dinner is DONE. I love to use a less expensive cut of beef like flank steak or sirloin for Instant Pot fajitas. 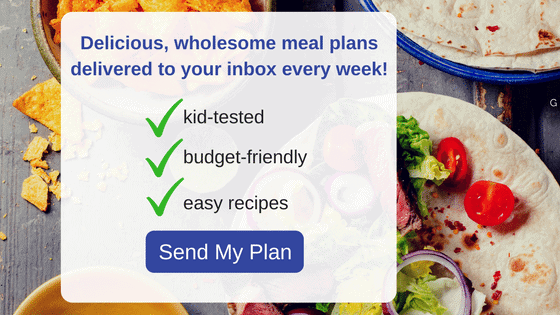 But you can certainly use boneless skinless chicken breasts to make Instant Pot chicken fajitas if you would prefer. Just shred the chicken using a hand-held mixer before serving–watch that tip in action here. It is best to serve the meat using a slotted spoon to drain off excess liquid. This will retain all the peppers, onions, steak and flavor but not leave you with a soggy tortilla. If you want to serve these instant pot fajita meat over rice, the extra sauce is delicious poured over the rice. 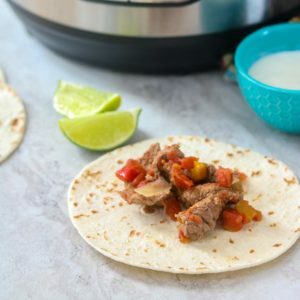 I use a bag of FROZEN pepper and onion strips because it makes these Instant Pot Steak Fajitas super easy and more economical in winter months when peppers are not in season. You can certainly use fresh onions and peppers if you would like. I would use 2-3 fresh peppers (any color) and 1 large onion cut into strips and saute in the Instant Pot on the saute function in 1 tablespoon oil until soft and tender. Then add in the remaining ingredients and proceed with the recipes. 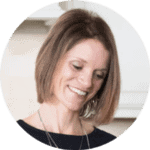 If you are gluten-free, you can use gluten-free tortillas to make Gluten-Free Instant Pot Steak Fajitas, or you can serve the steak fajita meat over lettuce for fajita salad or cilantro rice, or even cauliflower rice to keep this dish paleo. Steak Fajita meat will keep in the refrigerator for 3-4 days and freeze for up to 3 months. I have also used FROZEN sirloin steak strips before, I just increased the cooking time to 15 minutes instead of 8 minutes. 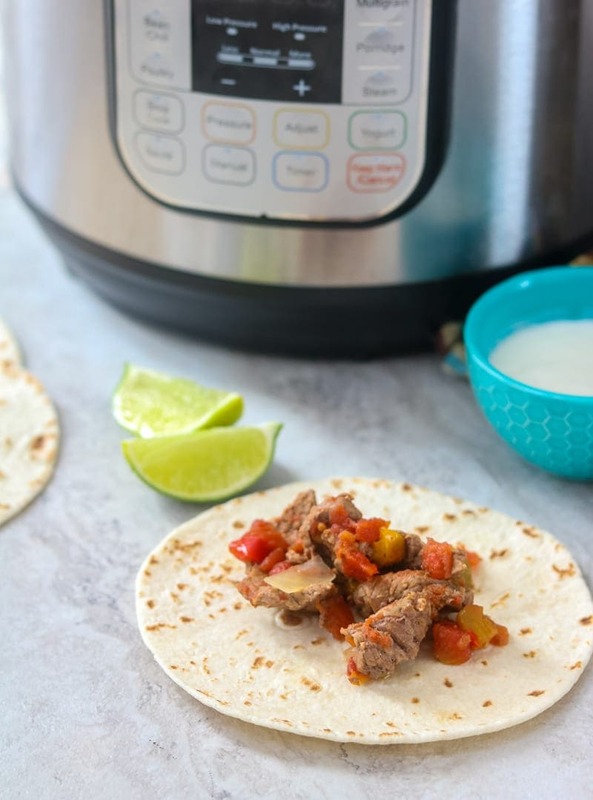 But if you would like to cook a frozen solid cut of sirloin or flank steak, place the frozen cut of meat in your instant pot with 1 full cup of beer or stock, sprinkle with taco seasoning and cook on high pressure for 25 minutes. Once pressure has released, remove the cut of meat, slice into strips and place back into Instant Pot top with the frozen peppers and onion mix and tomatoes. Set on high pressure and cook for an additional 5 minutes on high pressure. Place the flank steak and pepper and onion mix in inner pot of Instant Pot. Season with the taco seasoning. Pour in 1/4 cup beer or beef stock and pour tomatoes over top and spread to cover meat. Once cooking time is finished let pressure release naturally and then, mix in the zest and juice of the limes and cilantro if using. Serve with a slotted spoon for fajitas or with the cooking liquid over rice or quinoa. YESSS! I have everything I need to make this for dinner tonight! SO HAPPENING! I see a fajita night in my near future! 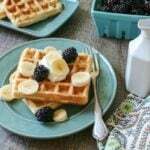 I love how the Instant Pot makes it so easy! 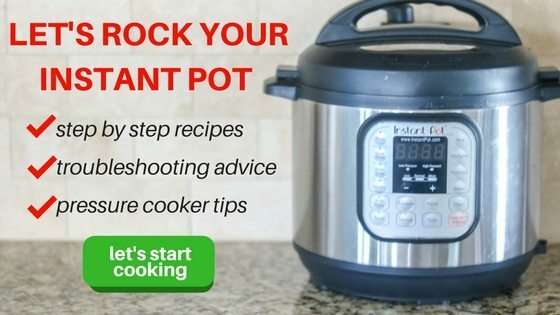 What size instant pot did you use will this work with an 8? My instant pot directions say to use at least 18 ounces of liquid (more than 2 cups) of liquid to pressure cook. Your recipe barely uses 1 cup. What gives? Hi Celena! If you have an 8 quart you may need 1 1/2 cups. But the tomatoes and peppers and onions give off excess liquid, making this recipe work. Hi, the fajitas sound delicious! I’m using a 6 qt instapot but I don’t think I’ll put tomatoes in this receipe. So I’m thinking I should probably put 1 cup of beer in the instapot? Hi Jackie! Yes, you will need 1 cup liquid for sure, so I would use either beer or stock. Enjoy!